My old friend the Mad Padre has finally been posted back to Ontario and is now a convenient 45 mins away. So last night I had the crew over for a game to both welcome him back to the fold and initiate my new Sherman squadron. 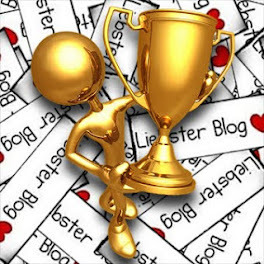 Mike has posted his own AAR with even more pictures on his blog here. The scenario is D+something, June 1944, outside the village of St. Pierre-Lapins. Bomber Command has given the vital crossroads a good pasting and now a squadron of the 1st Hussars (4x 4 tank troops and a Sqdn HQ of 3x tanks) and two platoons of the Royal Winnipeg Rifles have to advance through the fields and orchards and seize it. A kampfgruppe of 2 platoons of panzer grenadiers (without tracks), a platoon each of 3x PzIVh and 3x Panthers supported by 2x Pak 40 AT guns stand in their way. We advanced on a two troop front and on the right got into a fire fight as the first Pak 40 engaged us across a field. The first shots missed but after a motivational talk from the Mad Padre, Pasha Dan started rolling better, causing some damage to my tanks with mobility kills and gun sights damaged. Wierdy-Beardy and Mad Padre discuss tactics, or drink options. On the left the Shermans took cover behind a hedge and let the infantry lead the way towards an orchard. 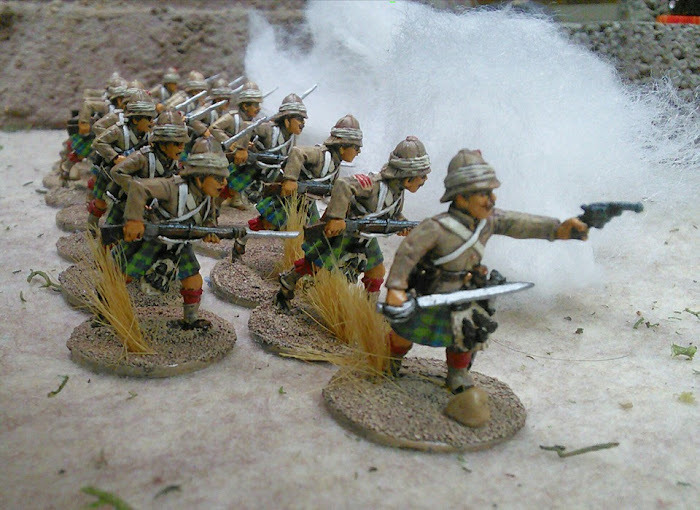 Wally Wargamer got his platoon in line over the hedge and into the 9" auto-spot range. The Mad Padre issued his commands and Wierdy-Beardy lit up the unfortunate Winnipeg Rifles with a devastating salvo, shredding the platoon in one go. Note to self; go prone with your last action or send out scouts first. The supporting Shermans started pounding the orchard with HE fire, but it was a bitter revenge. On the right, the second Pak 40 and a PzIV in the ruined village opened up, brewing up the Squadron HQ. The Sqdn COs tank was the first to go in a catastrophic fireball, killing the Old Man. Large amounts of HE fire from the Shermans did wipe out one of the Paks, and the Panzer Grenadier platoon fell back to the next hedge line. On the left some Panthers uncovered to engage the Shermans. After some desultory and unsatisfactory exchanges of fire with the Shermans, the Panthers then shifted to the center but attracted two more fighter bomber attacks. The first missed and hit the Panzer Grenadiers in the orchard. But the second scored our only tank kill of the game. So at game's end, Wally Wargamer had brought his second platoon over the road to sweep the orchard, chasing Wierdy-Beardy's shattered platoon out, trailing shock points and dead. Brett's Shermans were sweeping around the orchard to start getting flank shots on the Panthers who had arrived in St. Pierre-Lapin to start adding their weight to the fire fight with my two shattered troops burning merrily along the hedge row. The Canadians had taken about 50% casualties in men and tanks (damaged, immobilized and totally brewed up). The Germans had lost about 25% of their men and still held the crossroads. Without a set piece attack with proper artillery and more infantry, I don't think 3CID will be getting the cross roads. Of course if the 12th SS can mount a quick counter attack the Canadians would be bundled right back to their start line if brigade doesn't get some AT guns and Vickers MMGs up soon. 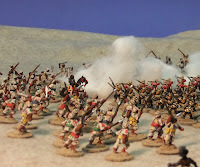 I've been working on a large commission of 15mm Sudan figures for a couple of years now. 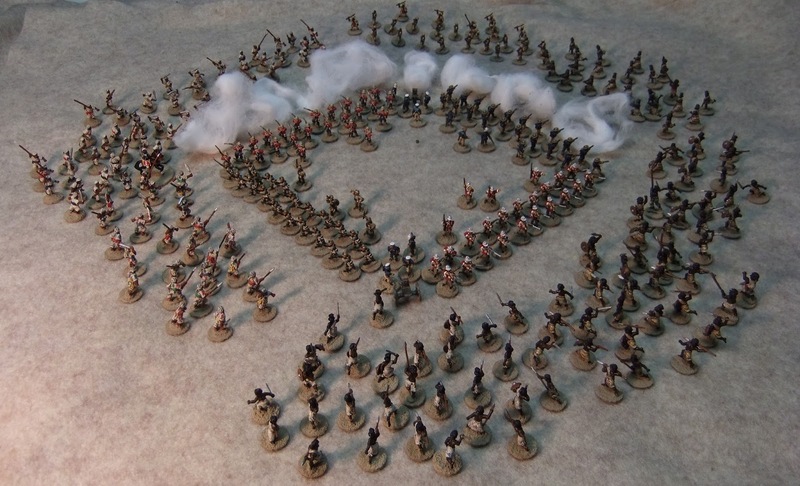 24 figure units, all individually based for playing The Sword and the Flame. 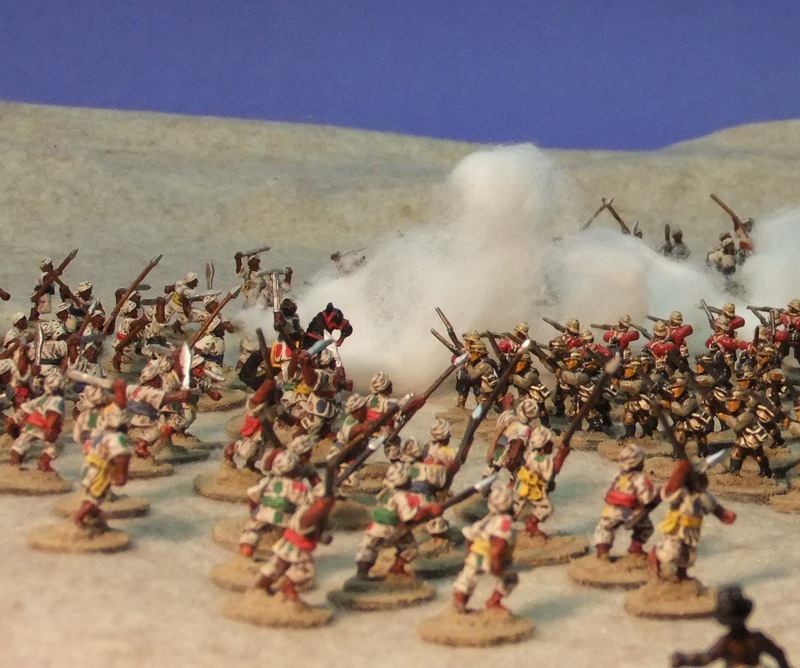 plus 4 extra Ansar and Beja command and a mounted Old Glory Amir. so about 300 figures and 2 guns. And that's just the first box. The second box is on my table waiting to be prepped! 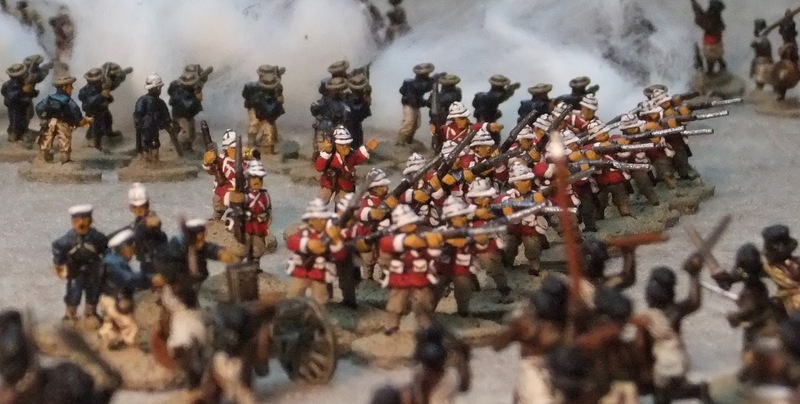 I showed you the first unit of redcoats way back in May 2011, when I used the Army Painter dip to finish them. 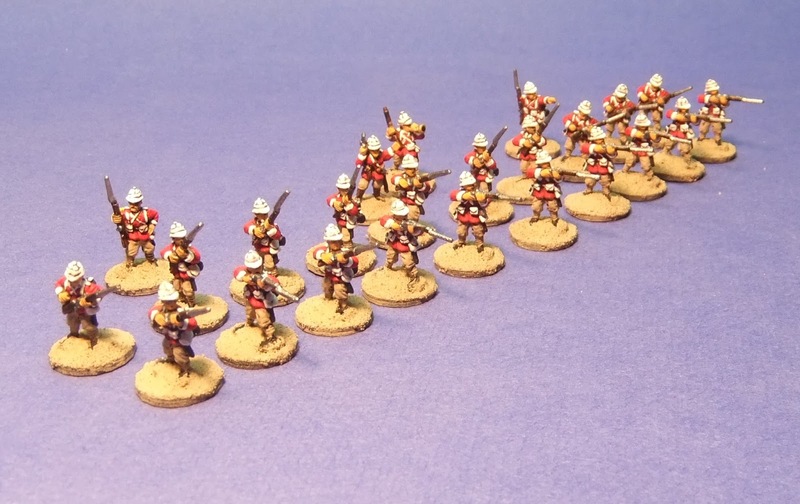 This second unit though, I had a better 10/0 brush and more confidence so I tackled the belts on the British infantry the old fashioned way. The bases are 15mm diameter Litko laser cut wood. Of course now it was time to get everybody out and set up a vignette to tempt my customer in Alberta. A classic square being rushed on all sides seemed the best way to get everyone into a single shot. Yes, there should be smoke from all four sides of the square, but then you wouldn't be able to see anything. The Peter Pig are nice to paint. I like the sculpts. The Old Glory are OK, lots of animation but rough. The Essex figures weren't so great I thought. Some of the Beja had weapons to glue in that I felt could have been cast in the hand and the poses are kinda flat. 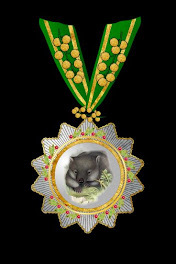 The Mahdists will look better once the flags arrive in the post.